of Whyville. Treat your computer-savvy middle school students to a one-of-a-kind virtual learning experience. Try some activities as a class or invite students to explore Roundhouse on their own. Visit Great Books Roundhouse now! 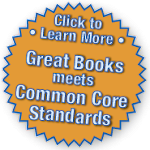 Log in and bring your students the benefits of Great Books in a virtual world. Visit our Whyville page to learn more! are trademarks of the Great Books Foundation.